There are literally no intricacies involved in building a wooden boat. It can easily be done at home, provided all the requisite materials and tools are in place. Here is a stepwise procedure that will make the job simpler. The first thing that needs to be done is to select the design for the boat. The different resources of design are internet, books, magazines, movies and television. The materials and tools needed for building the boat depends upon the design. For a simple wooden boat, the following materials would be required. Beside these different kinds of lumber, outboard motor, 2-inch long wood nails, 4-feet long scrap board, and metal sheet measuring 11/4’’x10’’would also be needed. Hammer, chisel, heavy drill and saw are some of the tools that would be needed for building the wooden boat. Transom is the first part of the boat that should be made. For it, 16-feet long spruce board should be used. With the aid of the saw, cut the board in such a manner that the top of the board is at least 8’’ shorter than the bottom. At the top, carve out a groove that 2-inches deep and 4-inches long. From the 16-feet board, the keel should also be made. One end of the board is narrowed down so that it is 6-inches in length and 1-inch in width. The other end should measure 15.5’’x1/2’’x4’’. Another spruce board is used to make the stem. Place the board such that it is 4’’ in height. On the left side carve out a groove that is 1/4’’ long and 2’’ deep. On the right side, crave out another groove that is 4’’ long and 2/16’’ deep. 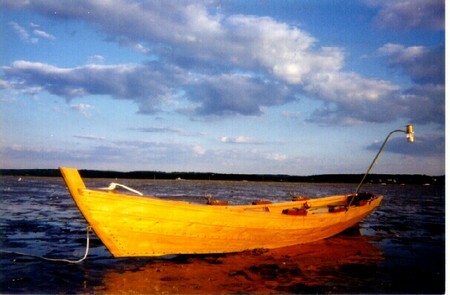 For the sides of the wooden boat, 16’ long planks are used. On each plank, cut a notch that is 1/2-inch deep and 1 1/2-inch wide. Affix the two planks together with the help of nails. Now that all the parts are ready, assemble them together. First attach the sides to the stem; after that fix the transom, and lastly, affix the bottom. Attach the keel to the stem, transom and bottom of the boat. Finally fix the outboard motor, and sand and paint the wooden boat.